Choosing blog topics that achieve your goals. Every blog article starts with an idea but how that idea develops can determine the level of success of all your efforts. Before you start investing time in catchy headlines, put content quality into focus and make sure you’re writing about the right blog topics. Do you know the difference between a terrible blog post and a high-performing one? It’s not the number of backlinks. It’s not the images the writer uses or the keyword density. It’s not the website on which it’s posted because even high DA sites often have poor-performing blog posts. All the best blog articles share one common characteristic: content quality. 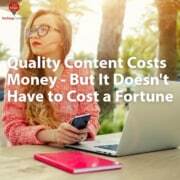 Content quality comprises various aspects. For starters, you read a blog post with certain expectations. You want it to answer a question, solve a problem, or provide more information on a particular subject. In other words, your blog posts will only perform as well as your readers will allow it. They click on your articles because they want what to read what you have to tell them. So, blog performance is directly related to the topics you select. Otherwise, your content may never be read, which means it will never bring the results you expect. How do you choose a blog post topic that people actually want to read? Evergreen content is content that remains relevant over time. It continues to draw visitors to your blog for months, even years, while still delivering value and accurate information. Granted, non-evergreen content isn’t completely off limits. Time-sensitive articles have their place in the blogging world but their benefits are usually short-lived. When you’re choosing blog topics, opt for topics that will remain evergreen. 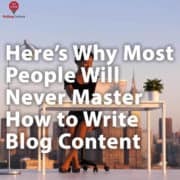 This can help you continue attracting readers to your blog over time and help you get more from every post. The best blog topics are built around specific keywords that fuel organic search. Use a data-driven approach to finding keywords that are heavily searched (at least 100 monthly searches or more) but have low competition (10 or less is ideal). 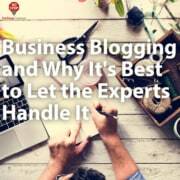 This powerful combination gives you the best chance of ranking for those keywords and driving traffic to your blog posts. Tools like Moz and Ahrefs give you insight into how keywords are performing. You can do a little spying on your competitors to see what keywords they’re ranking for. Get some insights into the content they’re producing that’s performing well, then plan to create your own content that’s better than theirs. Keywords will reflect one of these three intentions and it’s up to Google to decide what the user is trying to accomplish. Most likely, Google will think you’re looking to purchase these products. There’s no other context surrounding them. You’ll most likely see product pages from stores that sell these items. These keywords are similar to the ones above but put them into a clearer context. As a result, Google may show you reviews on headphones or word processing programs rather than product pages. And you’ll get tips for choosing a wedding cake bakery instead of actual bakeries in your area. Consider how, when, and why your readers use search engines to find content – specifically your content. Are they wanting to find your store or office in person, or visit your website? Are they trying to get more information about the services you offer? Are they looking to purchase products you stock? This can help you to choose the right keywords to include in your topic and put your content into better context. With ever-encroaching competition from video, your blog topics must be blog-worthy if you want them to rank well. When you search Google, your results may display several formats: blog articles, videos, product pages, or PDFs, to name a few. 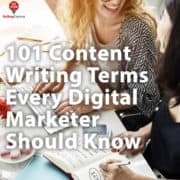 If you want your blog post to rank well, you’ll need to combine the right keywords with user intent to ensure your article displays correctly. For example, let’s say you’re writing a blog post about how to choose a laptop bag. Choosing the keyword “laptop bags” might seem logical but when you type that keyword into Google, you see product pages in the results – not blog articles. That’s because the user intent behind “laptop bags” is more akin to shopping rather than buying guides. Instead, a better keyword might be “laptop bags buying guide” or “how to choose a laptop bag”. If you have a construction blog and want to share steps on how to install a toilet, you’ll have a hard time ranking. Type “how to install a toilet” into Google and you’ll see that video largely dominates the search results page. That’s because this particular topic is better covered by watching, not reading. People may find it more beneficial to see someone installing a toilet rather than reading about it. When you’re thinking of topics for your blog, consider the ones that are best consumed through reading. From there, you can choose keywords that reflect the user intent to avoid having product pages and PDFs outrank you. When you develop your blog topics, craft your headline then copy/paste it into Google. Can Google figure out what you’re looking for? Or does it return search results that have little or nothing to do with your original topic? If Google is struggling to make sense of your headline, you need to rework it. 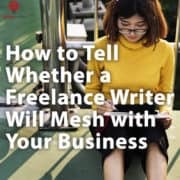 Some of these are closely related, but if you want the best chance of ranking well, you’ll need to get clear on how you want Google to translate your idea. 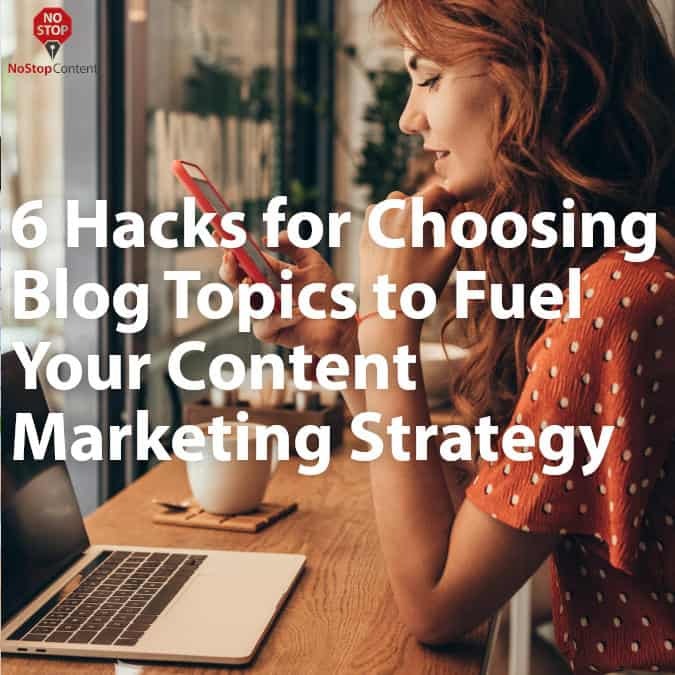 Taking a methodical approach to creating blog topics can help you choose the best things to write about rather than grabbing any idea that comes into your mind. Do they have questions about your services or products? Can you provide your readers with information they might seek out on Google? What problems can you solve for your readers, and do it better than other blogs? Once you start getting an idea, Google it for yourself. See what other blogs are covering on that same idea and what gaps their content leaves behind. Look for ways you can improve that topic and provide better resources to your readers. Plug a few articles into SEO tools like Ahrefs or Moz. See what keywords those articles are ranking for and which ones you might also be able to rank for. 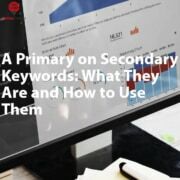 As discussed earlier in this article, you want to choose keywords that have a high search volume and low competition. You can also look at the organic traffic value of a post. This number shows how much it would have cost the website if they’d paid for that traffic rather than earned it organically. So, the higher the organic traffic value, the better performing the blog post. These are huge indicators that the blog article and topic are valuable to readers. People are actively searching for specific keywords and the blog post has proven to do well. Now, that doesn’t mean you should copy the post word for word. You’ll still need to put your own spin on the content, ideally making it better than the original. But this little piece of recon can help you determine what readers want to know and create blog topics based on their needs. The simplest way to put these six tips into action is to hire a content marketing agency that does all the hard work for you. Contact us today to discover how we can help you level up your blog writing and reach your fullest potential.